Bottles Caps were first introduced in the 6th Generation of Pokemon, being needed by Mr. Hyper in order to help boost the Individual Values of your Level 100 Pokemon. Since Mr. Hyper makes a return in this game, it's no surprise that Bottle Caps do as well. However, there is only one known way (outside of finding them randomly as Hidden Items within the Celadon City Game Corner) to obtain Bottle Caps in this game. 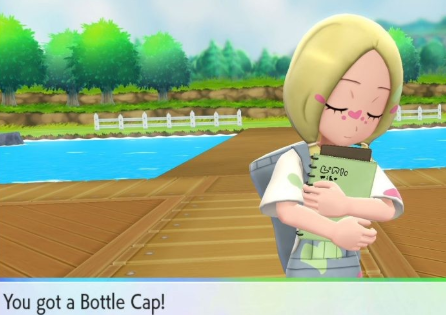 Believe it or not, the only way to obtain Bottle Caps is from the Pokemon Trainer known as Mina, the same who is a Trial Captain back within the Alola Region. You will first meet Mina after departing the S.S. Anne, having your first battle with her shortly after getting acquainted. After defeating her, you will then be able to battle Mina on a daily basis. After each and time she has been defeated, Mina will reward you with a Bottle Cap.